Jim Carrey has taken a shot at gun enthusiasts. The 51-year-old Hollywood actor appears in a new skit for the sketch comedy web site "Funny or Die" satirizing "Planet of the Apes" star Charlton Heston's love for firearms. Heston, who died in 2008 at the age of 84 from symptoms related to Alzheimer's disease, served as the head of the NRA from 1998-2003. 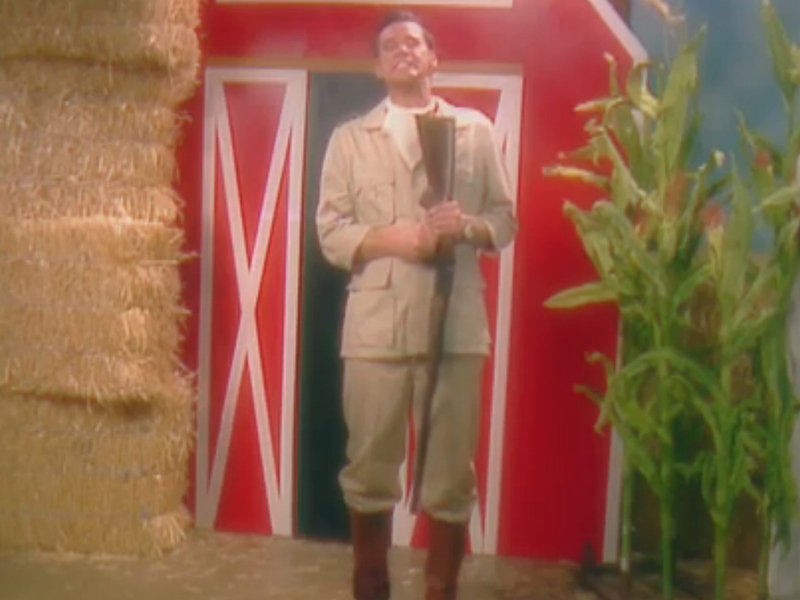 In the new "Funny or Die" sketch, Carrey plays both Heston and a member of a twisted country music band performing on "Hee Haw," the popular CBS variety show from the 1970s. As the lead singer of "Lonsome Earl and the Clutterbusters," Carrey sings the parody song "Cold Dead Hand," with lyrics like "The angels wouldn't take [Heston] up to heaven like he planned/Because they couldn't pry that gun from his cold dead hand." The "Funny or Die" video ends with Heston accidentally shooting his foot off, much to the amusement of Lonesome Earl's band-mates (among them Abraham Lincoln) and the "Hee Haw" studio audience. The song's title and lyric come from a speech Heston gave to the NRA during the 2000 presidential election in which he infamously declared that gun control supporters would have to take his firearms away from his "cold dead hands." Gun control has been in the spotlight more than ever recently given the Newtown school shooting and efforts in Congressto ban the selling of semi-automatic weapons. Other celebrities have already spoken out on the issue, but this new "Funny or Die" clip is sure to stand out with its "biting social satire" as Carrey himself calls it in the parody. The "Cold Dead Hand" song is available for purchase on iTunes. Tell us: Do you think Carrey's new clip is insensitive? Or is it funny commentary on a current hot topic?